The Cape Fear Museum’s new community park. Staff photo by Allison Potter. Rain didn’t stop families from flocking to the Cape Fear Museum on Friday, Sept. 25 as it opened a new park that includes artwork, educational exhibits and 32 species of local plants. One of the park’s exhibits, Native or Not, allows visitors to test their knowledge of plants by guessing which ones are native to eastern North Carolina and which ones were imported from other countries. Another exhibit that displays a ghost forest of tree stumps and photographs teaches people about salinity in the Cape Fear River. A third serves as a weather station, where people can record temperature and wind speed. The park’s foliage includes Southern live oak trees, black-eyed Susans, autumn embers encore azaleas and longleaf pines. Mangus said the weather is still too warm for some of the park’s species to be planted. “Hopefully, we’ll have everything in by November,” she said. 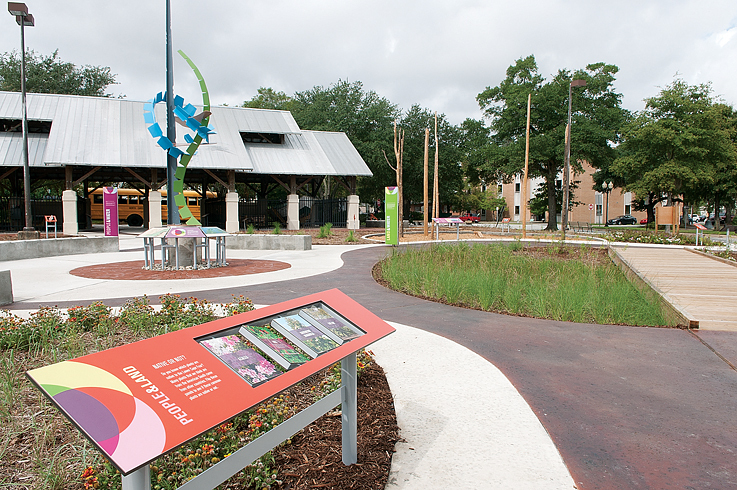 The green space also features “Traces,” a steel-and-concrete sculpture by South Carolina artist Joey Manson. A live oak tree, a Simmons Sea Skiff boat and maps of New Hanover County inspired Manson to create green and blue appendages in his piece. The different facets of the park are tied together by red-brown curved concrete walkways that mimic the meandering Cape Fear River. The project was developed with New Hanover County’s portion of the $35.5 million green space bond voters approved in 2006. The museum planned three days of activities to promote its outdoor addition. Exhibits manager Adrienne Garwood said the green space bond provided $500,000 for the project, and the Cape Fear Museum Associates raised $73,000 in private and grant funding. The family-friendly space, which is free and open to the public, only has a few rules. Smoking, consumption of alcohol, open fires and overnight camping are forbidden. Skateboarding and rollerblading are also forbidden. All pets must be leashed. The green space bond will also fund another new green space for downtown Wilmington when the New Hanover County public library at Third and Chestnut streets will transform the adjacent courtyard into a new park. The small courtyard, hidden from the street by a brick wall and adjacent parking deck, will be converted into an urban park that features an amphitheater for outdoor readings and performances, as well as gardens to help provide shade and green space. The library also plans to add a few café tables to create the alfresco atmosphere, providing downtown workers with an ideal spot for lunch or breaks. The New Hanover County library park is scheduled to open in 2016.